Thanks to all who came to our Koru Team assembly yesterday! It was the first time we have hosted this year. It was great to see all of our Koru 1 members trying to do their part. On Tuesday this week, we did a class brainstorm about what we might share. Our value focus was Creative. Korban and Zavier offered to take everyone's ideas and put together a short video. They worked so well together and the class were impressed with the final product. 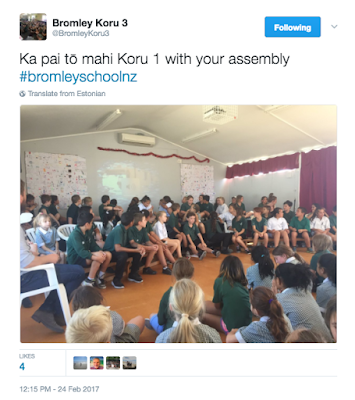 Features included some of our Twitter feed, students discussing their About Me projects (which we are sharing this week) and explanations about what is included in a mihi. Thanks to Luke, Keira and Sheldon who confidently shared their mihi with us. We look forward to hosting more events like this, especially when we have more exciting learning stories to share as the year progresses. I think the assembly went really well for our first one and it wasn't that scary cause there was only 5 classes cause only the Koru team was there and it wasn't to many people and maybe if we wanted to improve we could have spoke up more because about like 2 or 3 people had to say there line again because people were talking and the audience was talking alot about from the teachers and parents. I think for our first assemby for the year it was amazing i wish all the year six's where still here though. Overall I think enyone except Mr Kinley who spoke in the assembly could of spoke up a little more becouse some people had to say there line again. I think it went great even tho I wasent there I still think it went real good to particapate in the assembly.